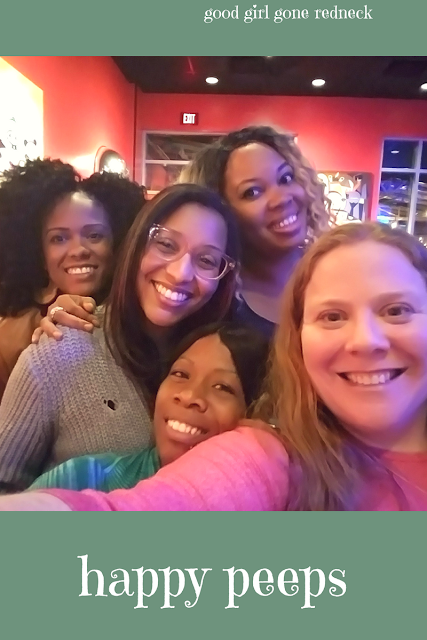 Earlier this week my fellow NCSocial friends and I were welcomed to The Cowfish Sushi Burger Bar in North Hills (Raleigh, NC) for a multi-course meal of deliciousness. This post is a thank you for the glorious meal that they treated our group to. I was not compensated for this post. I believe in the past I've introduced you to the NCSocial Facebook group my friend Kate of Life of a Ginger and I run for North Carolina influencers. We welcome bloggers, social media influencers and entrepreneurs. Consider popping in and joining us if you fall in this category. We are currently open to anyone located in NC, but our events have mostly been coordinated in the Triangle area. Anyway - back to the reason for this post! Kate coordinated with the team behind The Cowfish Sushi Burger Bar in Raleigh and we had the most incredible evening out. A party of 15, we enjoyed all that The Cowfish had to offer. From appetizers to alcohol (we covered that part!) to dessert. No question, the food is incredible. Would it be wrong for me to start with dessert? I mean, working backwards won't make you any less interested in the food there - I can promise you that. And if you check out my title pic you'll see I've already introduced you to my modified beverage of choice. I had a Snake in the Grass. The modification is that I had them omit the jalapeño part. I am a non-spicy girl and cannot handle that pepper business. It was so so good. I recommend it - with or without the jalapeños - depending on your preference. Dessert may have been my favorite part of the meal. Because. Well. Look at this. 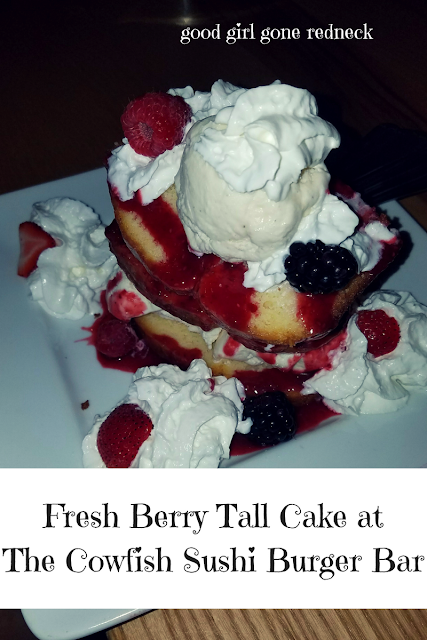 This is the fresh berry tall cake at Cowfish. And it's so good. There were other more chocolate-y options, but the fresh fruit, ice cream and whipped cream? Let's just say several of us at the table were spooning it up and enjoying it without stopping. It was THAT good. We also tried their amazing flourless chocolate torte and some delicious chocolate whipped cream cake that was joy on a plate. I couldn't eat all of them, I was so full. I mean, I TRIED them all. I just had to pick one to truly enjoy. And you probably know which one that was. Above all, the appetizers were a huge hit with our group. My personal favorite was the Crab Rangoon Dip. It's like a deconstructed crab rangoon. But several of them. It's so so good. That's the first picture you see below. The incredible manager and amazing staff also treated us to their famous All-American Bacon Double Cheeseburgooshi, and the Spicy Togarashi Shrimp. From what I heard around the table - that shrimp was extremely spicy - and amazing (remember, spice wimp here)! Below you'll see some more of the desserts, my super southern turkey burger that I created by taking an item off of the menu and eliminating some of the extras I don't enjoy and popping in a substitution. 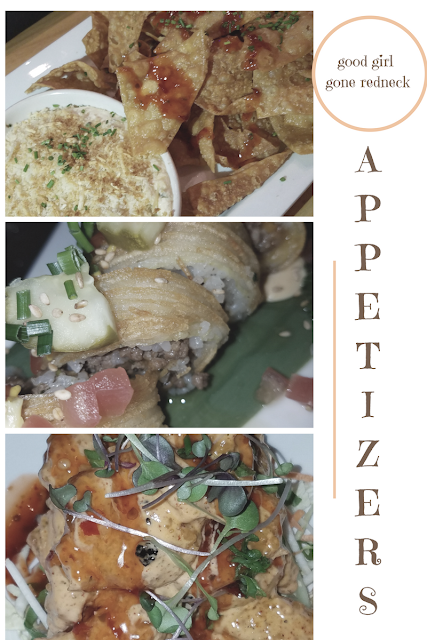 The Cowfish has a list of substitutions that will make the pickiest eater cry with joy. And if you look in that upper righthand corner? That turkey burger? Topped with pimiento cheese that's made in-house. The manager Hoff let me know that piece of info and then laughed when I asked if I could have a tub of it to bring home. Dude. I was so not kidding. In case you can't tell by this point in my post - everyone had a wonderful time and the food was absolutely incredible. I've always heard that local friends love it there, and now I know why. A quick peek at some happy faces after the amazing meal. The Cowfish has locations open in Raleigh, Charlotte, Birmingham, Orlando and Atlanta. So next time you're in any one of these areas? Stop in. Have the best meal of your travels. Or your week. Or whatever. Just go. Enjoy. You'll thank me for the recommendation - I am sure of it. * Reminder: This dinner was hosted by the incredible team of The Cowfish Raleigh. We had an amazing experience, excellent food and drink and are so thankful for this opportunity. I was not further compensated for this post or any social media shares I have done/will do to promote it. 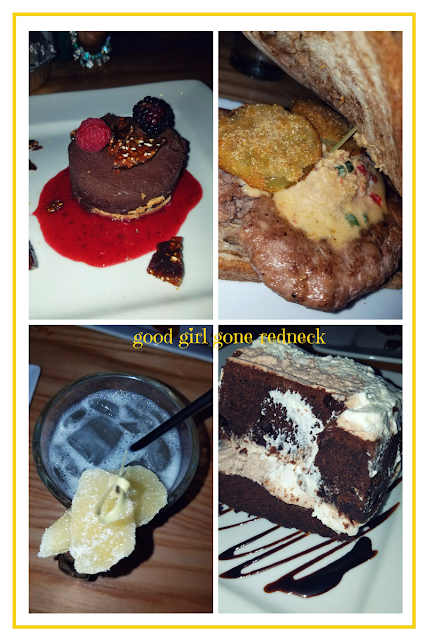 This night was such fun and full of yumminess! 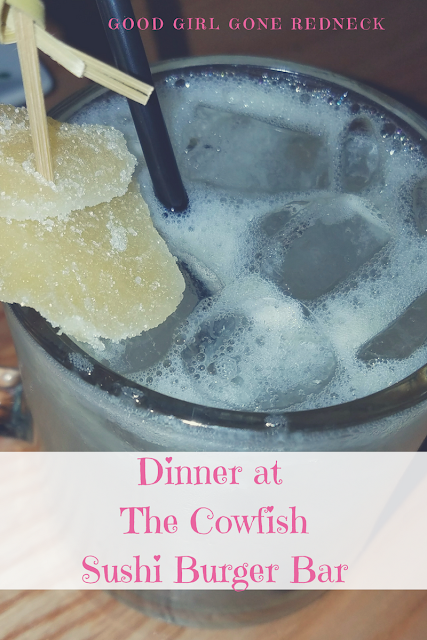 I think Iw ill need to make another trip to Cowfish simply to explore that menu a bit more! Oh and to get my own personal Burgushi because - YUM! I had so much fun! I'm happy we were able to make it happen. Can't wait to go back again! We had a great time! The Crab Rangoon was my favorite appetizer. I was stalking your cocktail and I really enjoyed my Lamb Vindaloo Burger! A true spin on Indian Spices. I was stuffed and still managed to taste test the desserts. Just Yum... Can't wait to go back! Aw, this makes me miss the Triangle! You all look so happy in the photo- and the food looks so good!